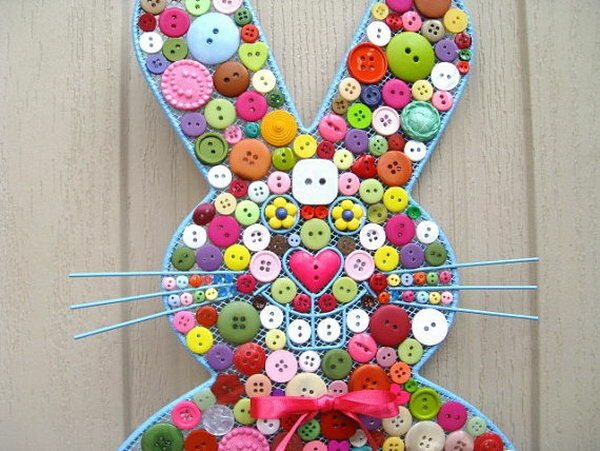 Easter Bunny Button Decoration. This button bunny is covered with buttons of various colors in different sizes and shapes, it really goes for the spring Easter decoration selection. 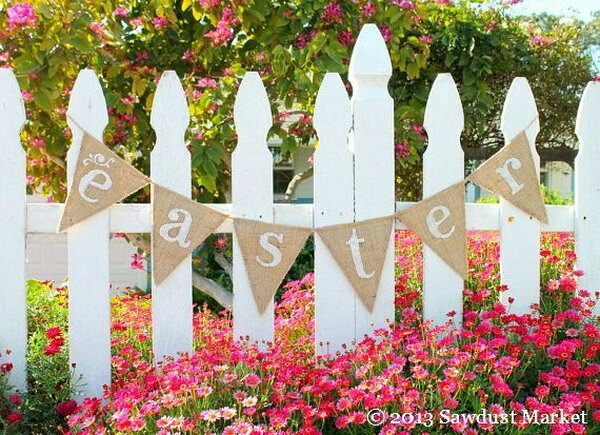 Easter and Spring Burlap Banner. This reversible Easter banner burlap pennant reads “Easter” in front and has sweet white cots at the back. It looks good at both sides and makes a perfect decor for you Easter festive outlook. 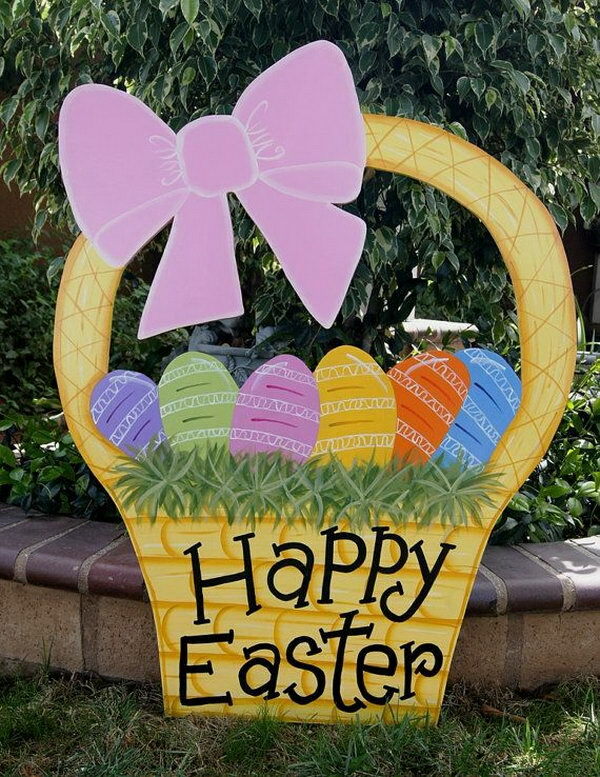 Wooden Easter sign with white bunny on the top gives off a vintage style, it looks so fantastic that I can’t wait to display it on the wall or the hang on the door. Pink Balloon Spring Decoration. 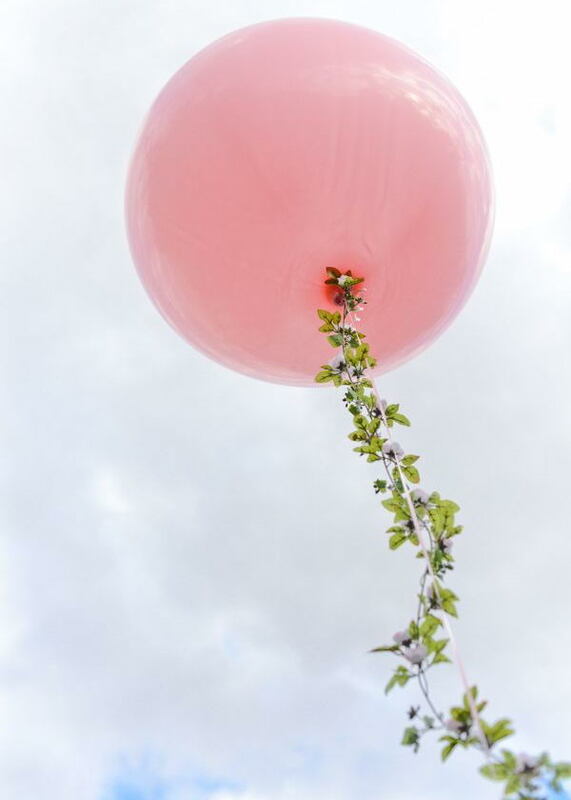 What makes this eye-catching is the floral garlands adding to the large-sized pink balloon. 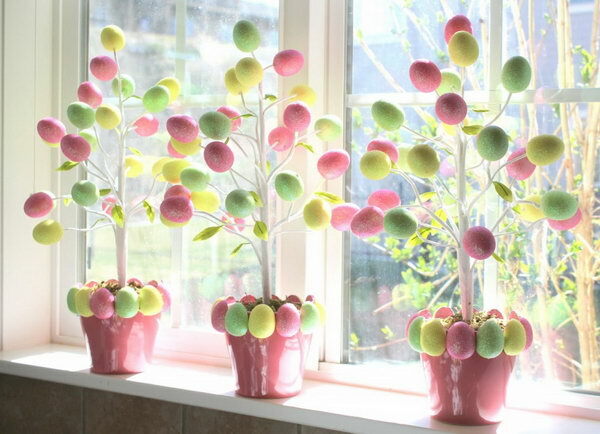 Try this creative Easter decoration idea to add some spring flavor, it’s so wonderful! Easter Bunny Decoration. 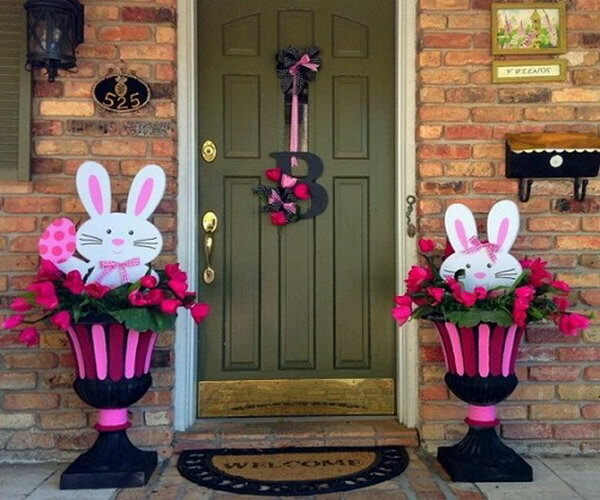 The cute Easter bunny in the decorated flowerbed makes this decoration style live and funny. The left one holds the Easter egg while the other one tries to hide in the flowerbed. 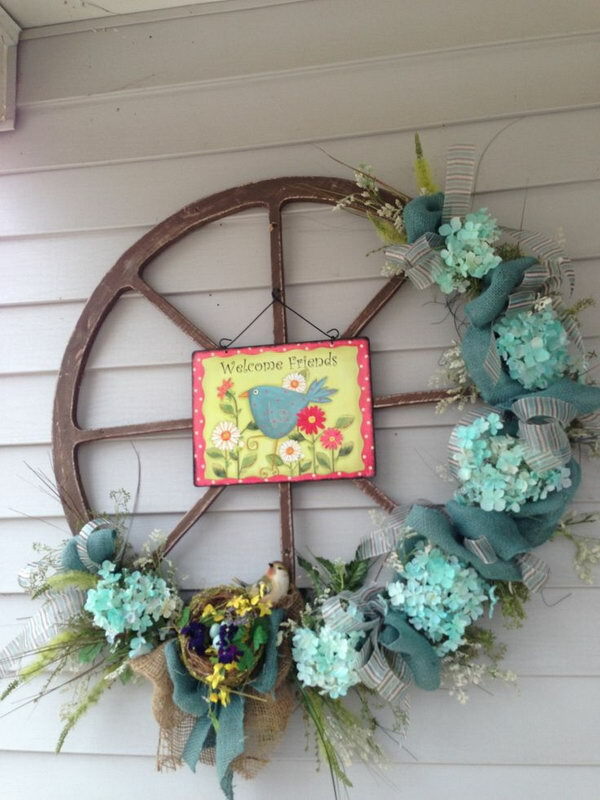 Easter Decorated Wheel Wreath. Wreath becomes a traditional way for Easter decoration with Easter egg, fresh flower, Easter bunny elements. What distinguishes this from other wreath is the floral decorated wheel. There is a picture hang in the centerpiece. Jelly Bean Tree. Make the best use of the cute jelly beans and some branches. 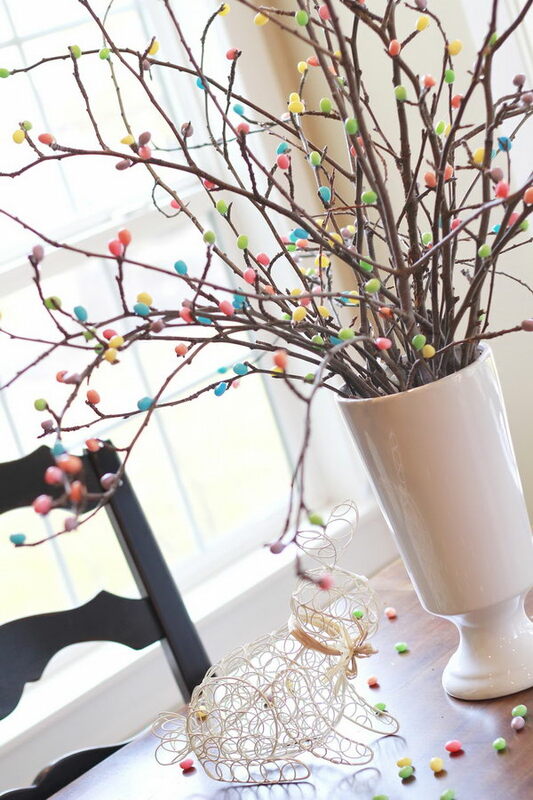 You can DIY this colorful jelly bean tree for the Easter. The best advantage is that you can keep this amazing decoration for the entire year. Easter Egg Garland. Make these colorful Easter eggs with strings wrapping around the water balloon. When the shape is almost done, you can pop it. 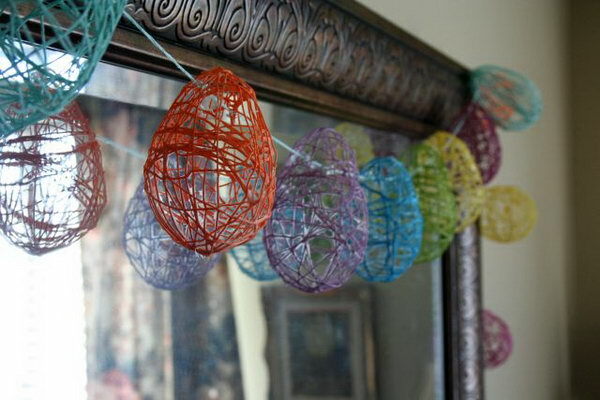 Glue these eggs on the string, you can hang it around the door, the window as you like. Target Dollar Egg Tree. 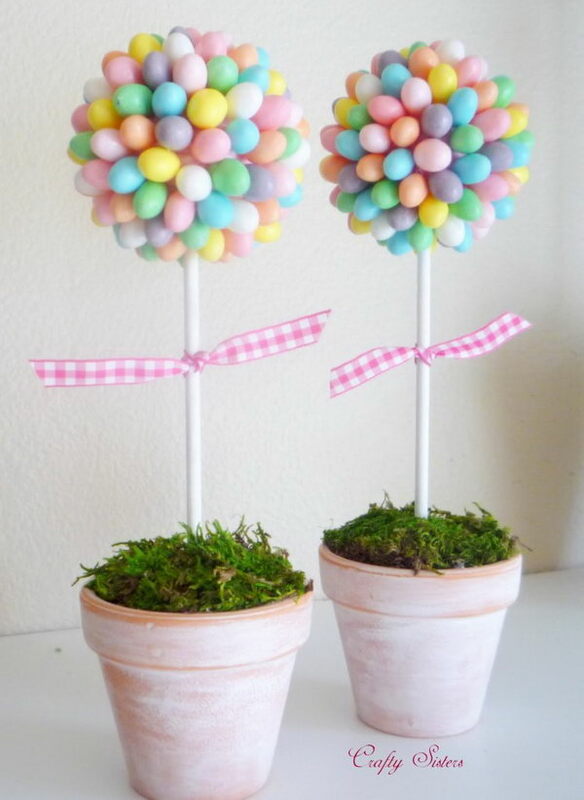 To DIY this beautiful Easter egg tree, all you need is the Easter tree a pot and 2 boxes of foam glitter Easter eggs. These eggs are light-weight, you can pock them onto the branch even without gluing. Bunnies on Construction Paper. 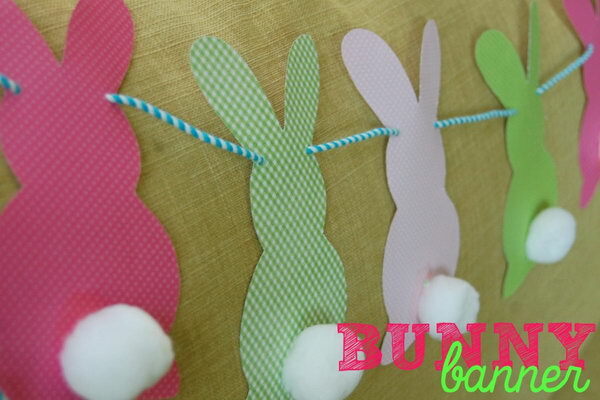 Glue the pom poms on the colorful bunnies on construction paper and thread them all with a string. You can hang them anywhere as you like, Your kid must like this adorable decoration very much. Jelly Bean Topiary. This cute and romance-themed jelly bean topiary adds a fresh spring flavor for your Easter decoration. Glue each jelly bean onto a pink Styrofoam ball add floral foam to anchor the dowel into and cover it with moss. 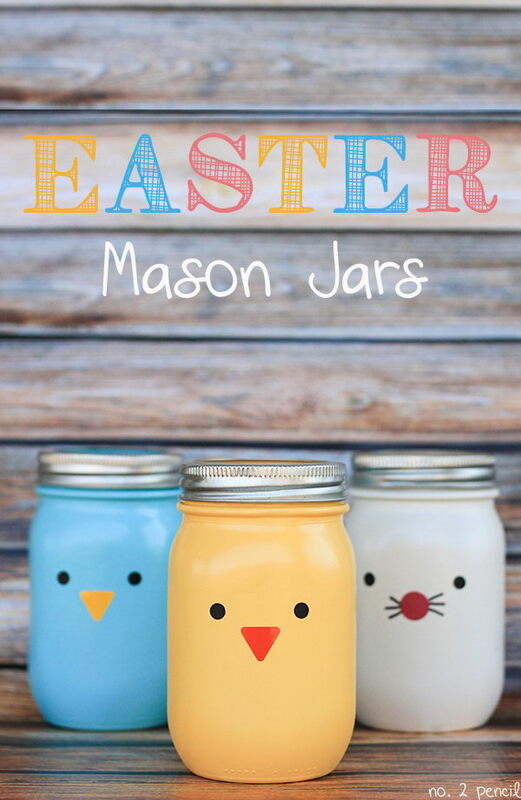 Cute Easter Mason Jar Crafts. These little Easter mason jars with bright colors are easy to make and can be used as vases or candy jars. Spray paint to mason jars and adhere vinyl to them, you can also draw some cute expressions. 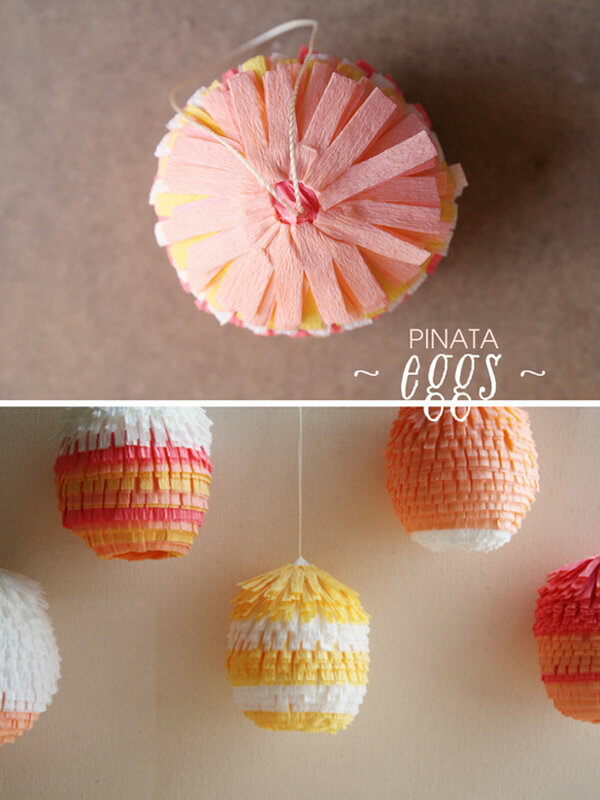 Cute Easter Pinata Eggs. DIY these pi?ata Easter eggs with blown-out jumbo chicken eggs, floral crepe paper, thread, glues and toothpicks. They are easy to make and will definitely brighten up your celebration. Adorable Easter Egg Decor. 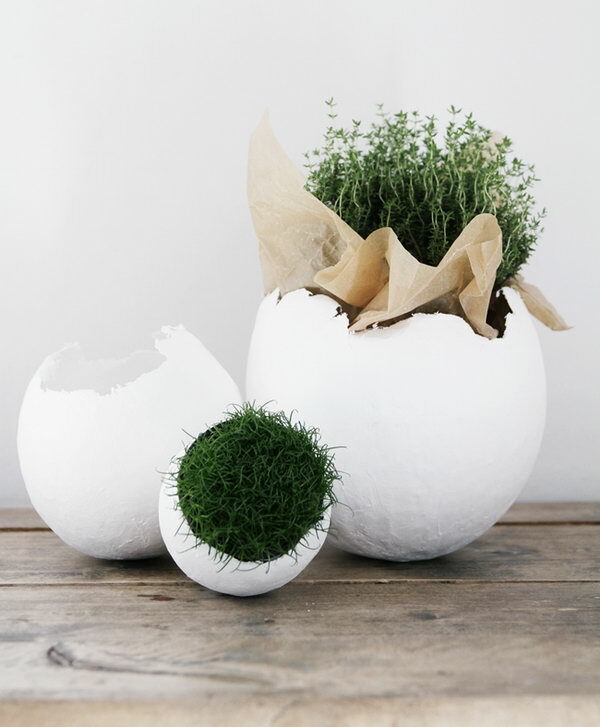 DIY this outstanding decoration craft by planting moss, grass or flowers in these crafty eggs. Once you see this adorable Easter egg decoration, you will feel happy for the whole day. 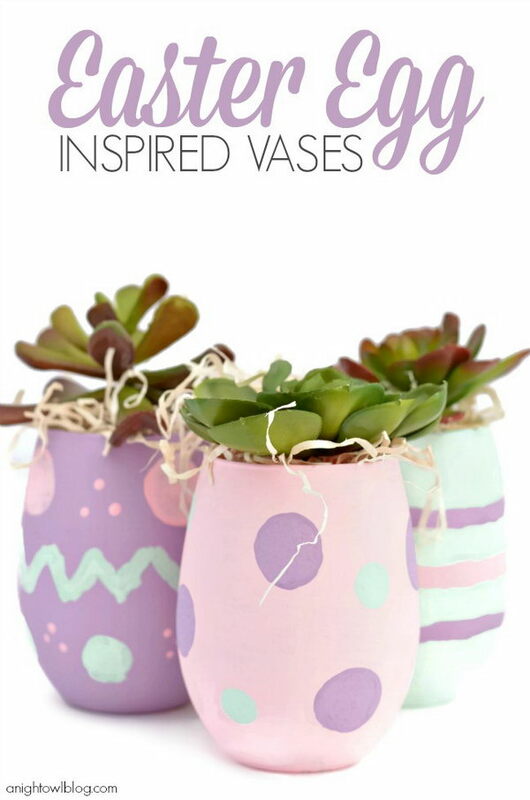 Easter Egg Inspired Vases. Paint the glasses with “Easter Egg” patterns. Fill the vases with natural filler and faux succulent stems. 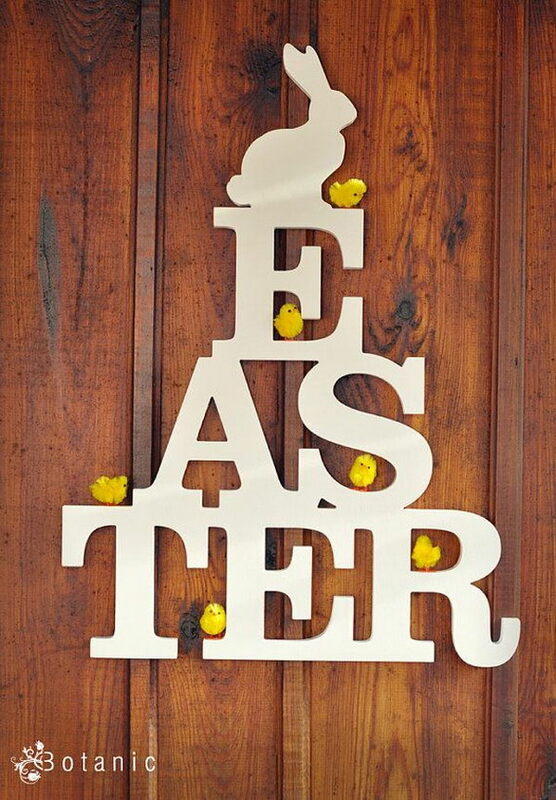 Make your very own to bring surprise to the Easter decoration project. Easter Subway Art sign. Paint the long board with acrylic paint, tape the words onto the board and glue the cute pennant at the right place of the board. It’s done with 3 simple processes. Try to DIY this cool subway design for your Easter decoration. 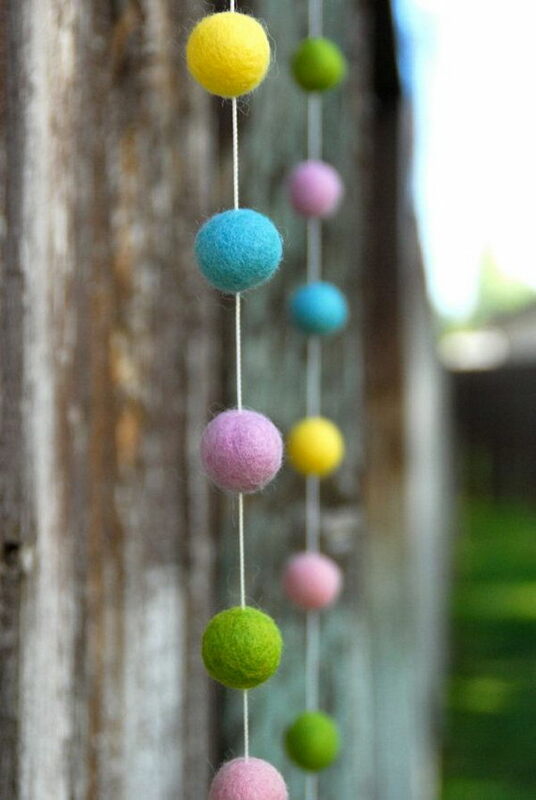 Spring Easter Felt Ball Garland. This kid-friendly table setting gives off a spectacular spring display with wheat grass in egg halves, daisies and purple tulips tucked in. Finish this off with colorful buckets filled with treats for kids. 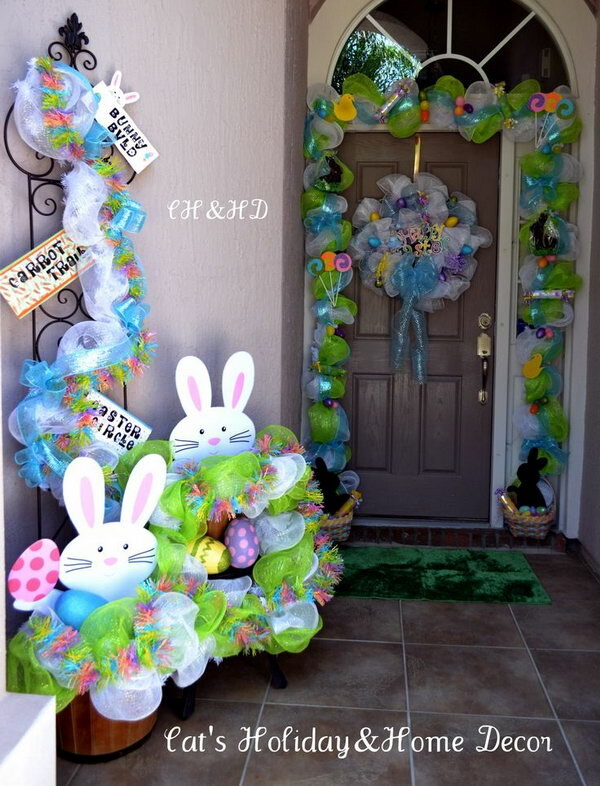 Easter Basket Door Decor. This well-refined Easter decor starts with mesh in white and lime green, add the ribbons as the base. Put two baskets filled with treats for children at two sides such as chocolate bunnies, rolled candy, Easter eggs and jelly beans. 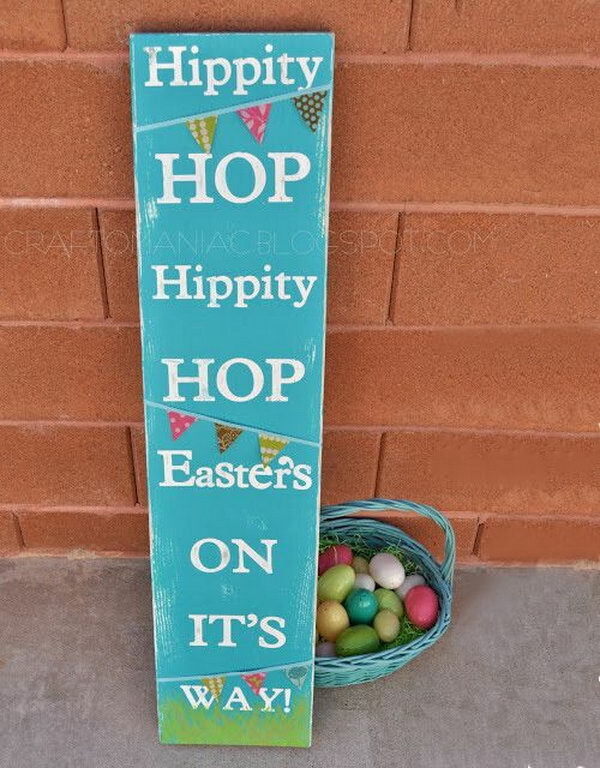 Easter Porch Decoration Idea. I appreciate this decoration style with amazing grace. 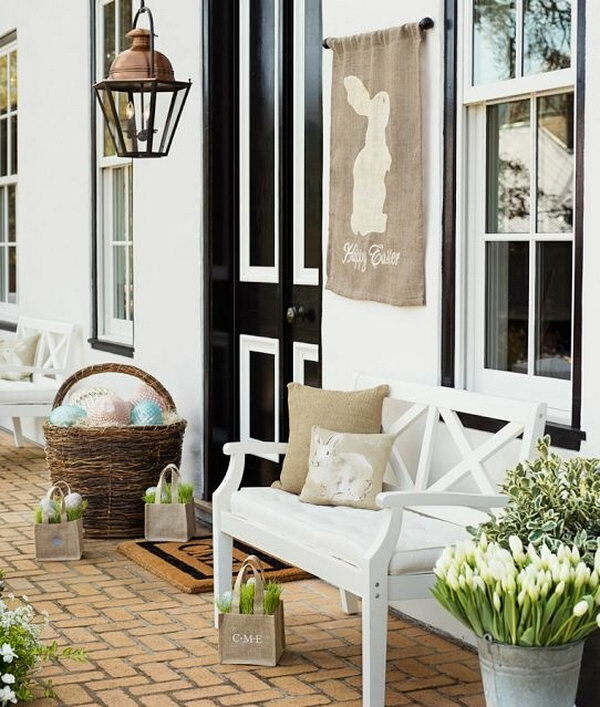 Display some fresh plants and baskets filled with Colorful Easter eggs. You can enjoy the good time sitting on your armchair. Easter Yard Decoration. 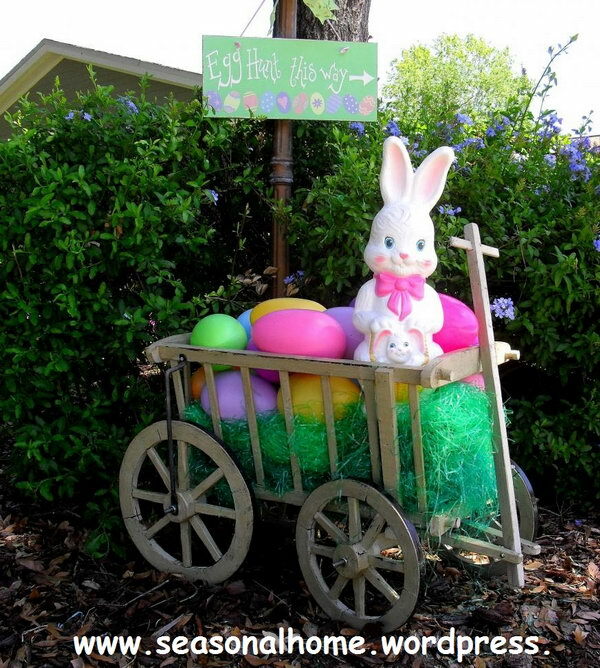 Display a cart with colorful Ester eggs and put a cute Easter bunny at the top. You can also hang the guide board to direct the way for egg hunting. 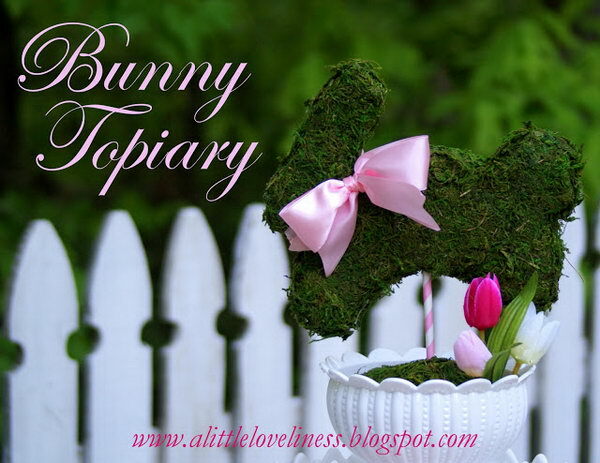 Make a Bunny Topiary. Pick up a white bowl and cover with a circle of sheet moss. Add some pink Easter eggs and silk tulip. Insert a moss covered bunny onto the stripe. Decorate the bunny with a pink ribbon around the neck. Easter Garden Decoration. 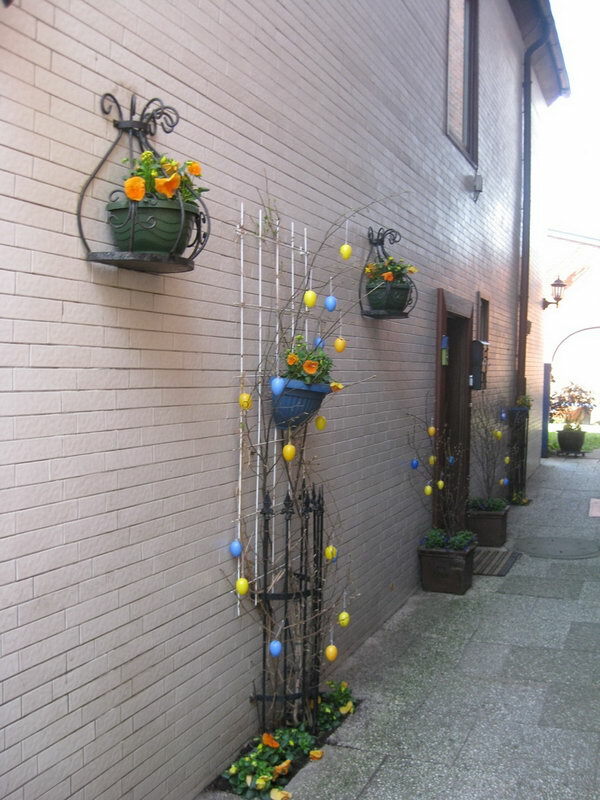 Fasten the flower pot on iron railing and cover some branches, hang yellow and blue Easter eggs on all the branches. You will get this beautiful garden design Easter decoration. Easter Basket Yard Art. This cute Easter basket is made of Baltic birch piece with 2 coats of polished varnish for protection. It’s so great to decorate your yard with this bright color art-piece. Easter Egg Decoration. 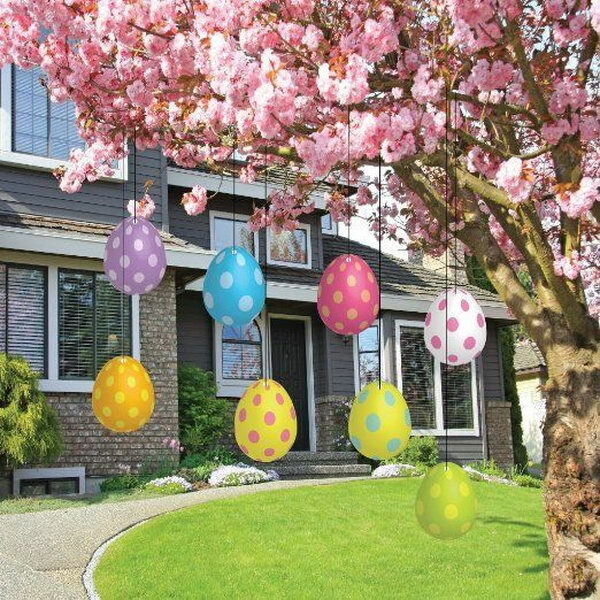 Hang colorful Easter eggs under the branches of beautiful flower tree is a simple yet fantastic way to decorate your yard for Easter. These plastic Easter eggs with polka dots are weather resistant and durable. Carrot Easter Yard Sign Set. When it comes to the element of Easter decorations, you may think about bunny and Easter eggs. 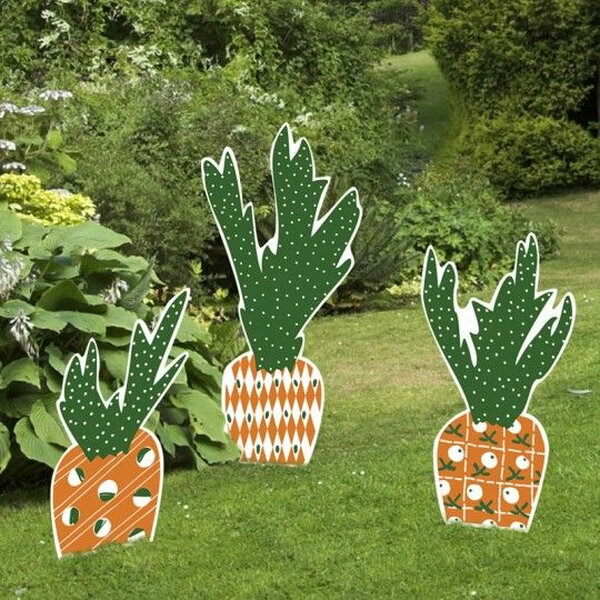 These Easter carrot yard signs and stakes gives off a new look for Easter decoration. They are fade-resistant and can last from bad weather.